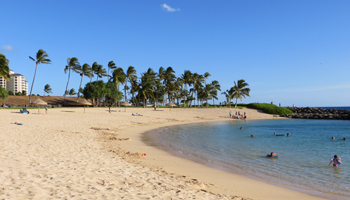 Ko Olina Lagoons: Popular Hawaii Beaches. 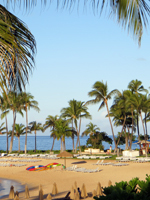 Ko Olina Lagoons: Meticulously Manicured Paradise! 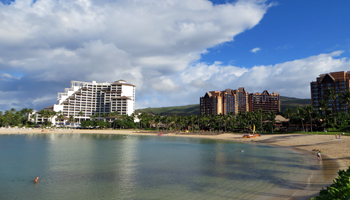 The Ko Olina Lagoons are four man-made beaches along Oahu’s west shore next to the Disney Aulani Resort and Ihilani Ko Olina Resort. For those who prefer a controlled environment, these are the ideal Hawaii beaches for you! On the other hand, for those who believe the beach should be more than a swimming pool with sand, there are a lot of better beaches (this is my opinion, and many people won’t agree with me on this one). I concede, however, that they are very nice sandy-bottomed swimming pools. Each lagoon has rock jetties to break the surf and lots of beautiful white sand. The water is perpetually calm. The grounds are meticulously manicured. The bathrooms are clean. Everything is completely antiseptic. Moms with young children will love it! With goggles or a snorkeling mask you might even see turtles swimming around in some of the lagoons. Just remember that it is illegal to interfere with them in any way. Because these beaches are intended to be fairly exclusive for hotel guests, crowds are controlled by limiting the available parking. 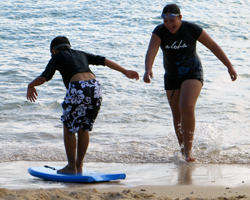 If you are a guest at one of the Ko Olina resorts, then your Hawaii beach vacation is all set. You’ve got it made! Go have fun! However, if you’re not a guest and thus need to drive in… well, good luck with that. On a weekend/holiday, you basically have to get to the Ko Olina Lagoons at the break of dawn if you hope to find any parking. The rest of the time, it’s just a matter of luck when somebody will leave and open up parking for you. There is no street parking, and you'll be towed if you try. I’d suggest that you just follow the signs to each of the lagoons and check for available parking. The very last lagoon has the most available parking. If it’s full, you’re probably out of luck. You can check the other lagoons on your way back out; but at that point, I would probably start driving over to White Plains Beach or one of the other west shore beaches (which I prefer anyway).